This was a much anticipated concert for several months. 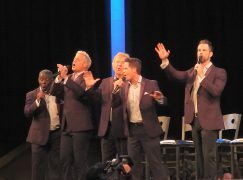 The Booth Brothers followed Soul’d Out Quartet and didn’t disappoint a full house of fans – a lively bunch of approximately 400 concert attendees. Michael Booth was his usual funny self. He kept the crowd laughing, especially with Danny Jones, editor of Singing News Magazine, who was the emcee for this program. Michael Howard, pianist for Soul’d Out, favored the audience with almost 30 minutes of pre-concert music. As it probably is with the pre-service music at your own church, people were chatting and milling about. Michael seemed unfazed by the chaos and played a nice program that included “How Great Thou Art,” “It Is Well With My Soul/ I Want to Be Ready to Meet Him,” “What a Friend We Have In Jesus,” ” Just a Closer Walk With Thee,” and another medley of several hymns including “Amazing Grace,” “In The Sweet By and By,” and others. Michael also played his arrangement of “The Lord’s Prayer” during the Soul’d Out set. Bryan Hutson joined Soul’d Out Quartet at the beginning of this year and this is the first time I’ve seen them in concert since then. Bryan is a great fit with the group and they have already recorded a couple of projects with him. The other members of the group include Dusty Barrett (tenor), Matt Rankin (lead), and Matt Fouch (bass). For those who aren’t familiar with Soul’d Out, they were formed in 2001 as a trio and then changed to a male quartet in 2004. 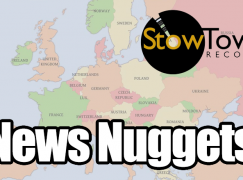 They are based out of Cincinnati, Ohio and were the recipients of the Horizon Group award during the 2010 Singing News Fan Awards. 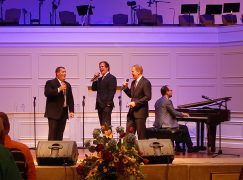 From their brand new hymns CD entitled “Soulace,” they sang Unclouded Day (featuring Bryan), “Traveling Home,” “Kneel at the Cross,” and “Over There.” From their older repertoire, they sang “I Want to Make a Difference,” “God’s Perfect Plan,” “Through the Blood,” “Cool Drink of Water,” “Who Is This Man,” “When I Pray” (Diana’s personal favorite – here’s a link from a previous concert! ), “I Am Blessed,” “Doing Things God’s Way,” and “See Ya Over There” – which got a standing ovation! Bryan sang a solo of “In the Garden” and gave a very touching personal testimony between the verses. They didn’t perform any songs from their 2nd new album, “What the World Doesn’t Know,” but they did have a pre-release version of the CD which I bought and which is wonderful! 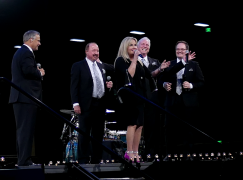 It’s hard to remember all of the awards that Michael and Ronnie Booth and Jim Brady have won as a group and as individuals during the last several years – but it’s a whole bunch of them!! The Booth Brothers’ set included all the fan favorites like “Feeling Fine”, “The Blind Man Saw It All”, “Welcome to the Family”, “Still Feeling Fine”, and “Don’t Fence Me In”. 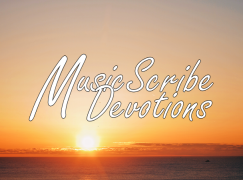 They also sang “See What a Morning,” “When You Bow at Jesus’ Feet,” and “Since Jesus Came.” The most notable, to me (Lynn) anyway, were “In Christ Alone”, “He Came to Me”, “We Believe” and the one song that has hit home with a lot of people is “She Still Remembers Jesus’ Name”. If you have a chance to see Soul’d Out Quartet and the Booth Brothers together in concert don’t miss it. If you do, you will miss a very special night. We want to send a special thanks to concert promoter Robert York for bringing these two groups together for the concert. Bobby worked really hard on this concert and he has already had ticket requests for another concert with these same two groups next year even though a date hasn’t even been set yet! THANKS to all the folks that turned out without them the concert would not have been a success. Think this is one of the best concerts that I have ever promoted both in attendance and concert performance by the artist. I’ve seen many favorable comments as well as received many e-mails about the concert. Yes we are working on a date for 2013. It’s a little early but hopeful we can bring these two groups back together next year.